The nutrients from the foods you eat help support your baby's development and growth. Although roast beef deli meat might seem like a healthy option at mealtime, deli meat actually contains unhealthy components and bacteria that can pose a health risk to both you and your unborn baby. As always, see your doctor if suspect you've eaten contaminated roast beef or you exhibit symptoms of infection. Deli meats like roast beef tend to be high in sodium, which can cause excess fluid retention and be unhealthy for both you and your unborn baby if you have high blood pressure. In addition, precooked meats like roast beef deli meat can contain a harmful bacteria called listeria. The listeria bacteria can not only sicken the mother, but it can cross through the placenta and harm the baby. It can also be transmitted via the birth canal during delivery. The listeria bacteria can cause flulike symptoms such as fever, nausea, muscle aches, head pain and vomiting. If the infection travels to your nervous system, it can lead to disorientation and convulsions. In severe cases, listeria can cause life-threatening complications such as blood infections or an infection of the brain membranes called meningitis. It can also infect your unborn baby and cause premature delivery, miscarriage or even stillbirth. You can help prevent these serious complications by being treated with antibiotics as soon as you suspect infection. 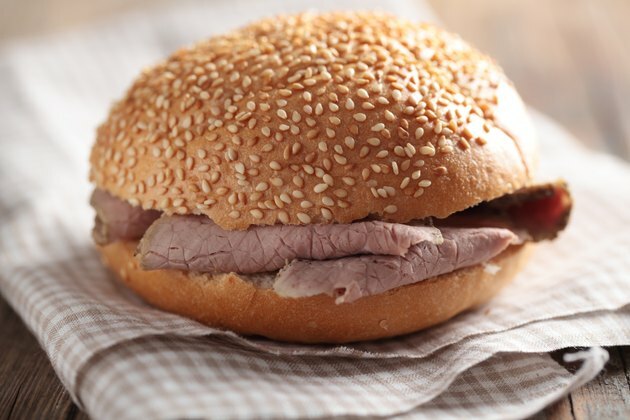 If you must eat roast beef deli meat, cook it until it is steaming hot. The internal temperature should read 160 degrees Fahrenheit when measured with a food thermometer. Thoroughly reheating the deli meat prior to eating it will kill the listeria bacteria, thus making it safe to eat while pregnant. Keep the fluid from the roast beef deli meat package away from other foods, cooking surfaces or utensils to prevent cross contamination. If you'd rather completely avoid roast beef deli meat, choose nondeli meats such as steak, roasted chicken, grilled turkey, meatballs and tuna fish. Because of its high mercury levels, however, tuna fish should be limited to two times a week. Salted and dried deli meats such as pepperoni and salami are also alternatives. Choose lower sodium and lower fat versions since dried deli meat tends to be high in sodium and saturated fat.